In May 1939, the S.S. St Louis left Hamburg for Havana carrying almost a thousand refugees from Hitler’s Germany. Over the following weeks, the ship criss-crossed the ocean, buffeted alternately by hope and disappointment, as it sought asylum in a friendly port and war drew inexorably closer. 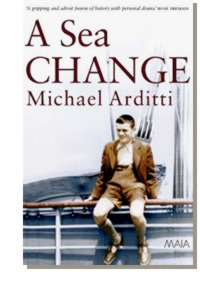 Based on actual events, A Sea Change takes the form of a memoir of one of the passengers, fifteen year-old Karl, heir to a department-store fortune. In later life he recalls both the horror and excitement of the trip, along with his personal voyage of discovery, as he learns the truth about his family, battles Nazi crew members and plans a mutiny, and describes his first, passionate love affair with the beautiful young Johanna.